When it comes to the federal government’s seemingly muted response to a severe drought in its most populous, richest state, Republicans and Democrats in Congress have faced sharp criticism. GOP lawmakers from California and their supporters are accused of offering solutions that abandon responsible policies that follow federal law in protecting the Sacramento-San Joaquin Bay-Delta Estuary’s ecosystem and its endangered species. Democratic lawmakers from California and their supporters are accused of being too concerned about preserving the Delta at any cost, and in doing so showing indifference to the fate of poor people in the Central Valley who need agricultural jobs. Both parties in Congress have been knocked for their inability to work together on a crucially important issue. But recent media coverage has had a third focus of criticism: the Obama administration, which has been depicted as distracted and detached when it comes to helping California deal with its mass water shortage. With more than 70 percent of California now classified in a state of “exceptional” or “extreme” drought, Uncle Sam is floundering. “We need leadership from the federal government,” pleaded Cannon Michael, a politically engaged farmer from Los Banos in California’s acutely dry San Joaquin Valley. President Barack Obama has not used his bully pulpit to persistently drive a Western water agenda. He has visited California 28 times during his presidency, but his lone trip to the state’s San Joaquin Valley, ground zero for the drought, occurred 18 months ago. Congress setting a bad precedent? For the most part, the debate is not bogged down by partisanship — in fact, some Democrats are sounding like Republicans on select issues. Members of both parties want to help quench California’s thirst by directing more pumping from two massive government water projects and boosting water storage for times of need. But divisions over states’ rights, the environment and the role of agriculture have left many in Washington at odds, and attempts to tackle the problem in previous years have foundered. 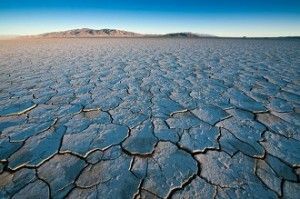 Still, how Congress deals with drought in California could set a standard for policy reforms across the United States, as droughts affect more regions and science suggests such environmental disruptions could become increasingly common as the Earth’s climate warms. The CQ Weekly piece praised Sen. Dianne Feinstein, who is cited by virtually all Washington reporters who write about the federal response to California’s drought as being the adult in the room. Her reputation for centrism has often been boosted by her environmental moderation. But after more than nine months of stop-and-start negotiations, Feinstein still hasn’t hit on a deal that both House Republicans and a majority of the Senate will accept.